Monroy’s description seems pretty apt with the heavy toned guitar rhythms, fast percussion and dark, distorted vocals prevalent across their tracks. Catastrophic Retribution displays more technical aspects from Skeletal Remains with its varying tempos; the fast-paced sections are high energy, sections with a slower tempo create an immersive dark atmosphere. The slower tempo also gives the spotlight to the lead guitar melodies. The complementing tones used throughout the track cohesively draw all the sections together. The track also includes sections of double pedals being used on the bass drum – a must in the death metal genre – that emphasises fast paced and high energy sections. 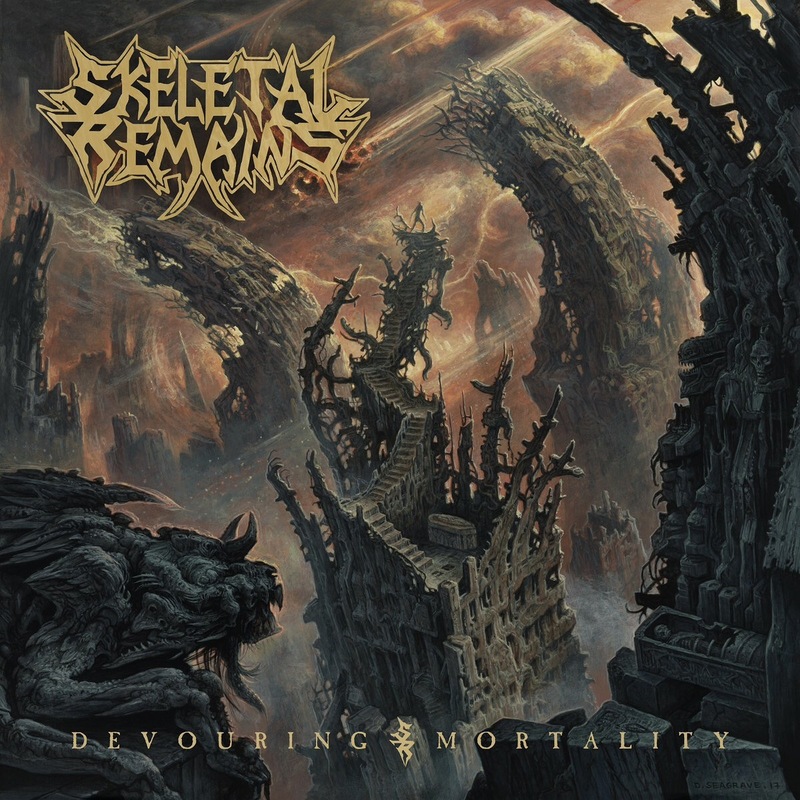 Devouring Mortality certainly gives Valles, the drummer featuring on this album, a work out with the length of double pedal drumming involved. This heavy drumming section is layered with harmonising guitar melodies which add extra depth to the already full sound. The opening to Torture Labyrinth is incredibly dramatic and atmospheric. The slow tempo, low toned guitar melody, layered with a higher octave of the same melody creates a full sound that is gradually built up. The addition of a further lead melody in a higher pitch creates scream-like sounds with the use of vibrato when bending the guitar strings. Heavy descending chord sequences amplify the dark atmosphere of the track. Echoing effects on Monroy’s vocals portray ideas of lost, tortured souls. Skeletal Remains illustrate their ability as musicians by expertly reflecting the themes of the track through the instrumentation. Lifeless Manifestation is the shortest track on the album at just over one minute in length. The first fifty seconds are dominated by a heavy chord sequence with accompanying percussion. This repeated sequence is then interrupted by screams, shouts and echoing voices. This unusual interlude adds something a little extra between the tracks, and it certainly ties in well with the track Torture Labyrinth. Skeletal Remains have made a noise with Devouring Mortality. The tracks on this album display the band’s technical abilities and their knowledge of the death and thrash metal genres. The album’s dark themes and “old school” vibe are welcome additions to the wide range of releases in this genre. With many death metal bands becoming more experimental with heavy genres, reworking traditional death metal sounds will appeal to many fans of that generation and many new listeners. ‘Devouring Mortality’ by Skeletal Remains is out now on Century Media Records. Next Post ALBUM REVIEW: ‘ruiner’ by nothing,nowhere.